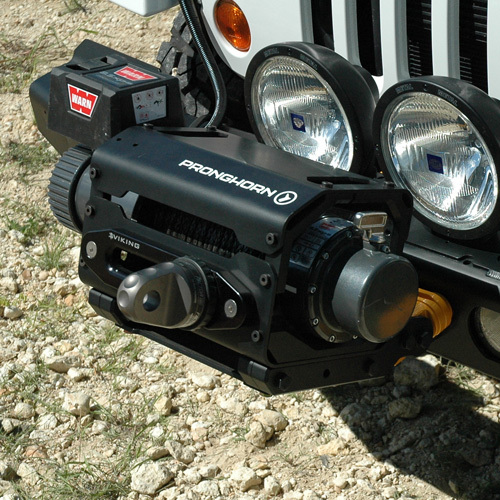 If your off-road and expedition efforts require maximum performance in severe loads this is your shackle mount. The patent pending design of our Rotator Shackle Mount is built for severe-duty applications and extreme side angle loading that will fail standard rigid shackle mounts. Load rated at 45,000 lbs (minimum breaking strength), this innovative design eliminates the dangerous side-loading weak points found in traditional rigid shackle mounts by allowing the recovery shackle to freely rotate a full 360 degrees to any loading angle. 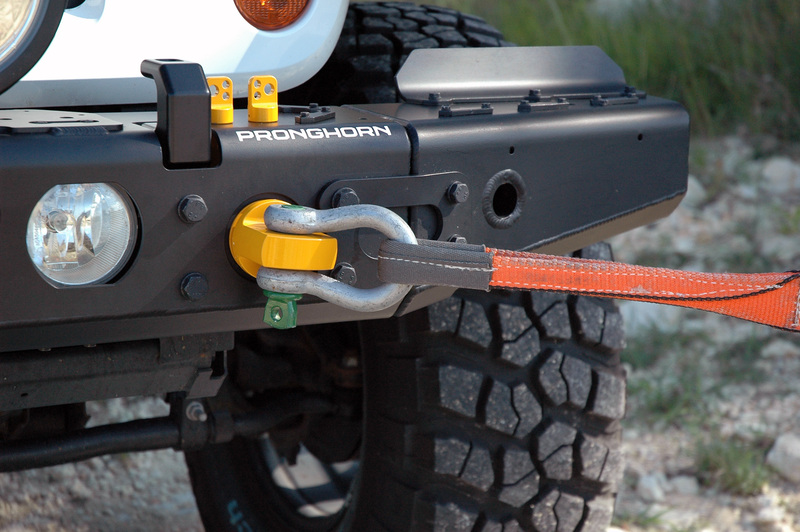 If your off-road and expedition efforts require maximum performance in severe loads this is your shackle mount. The patent pending design of our Rotator Shackle Mount is built for severe-duty applications and extreme side angle loading that will fail standard rigid shackle mounts. Load rated at 45,000 lbs (minimum breaking strength), this innovative design eliminates the dangerous side-loading weak points found in traditional rigid shackle mounts by allowing the recovery shackle to freely rotate a full 360 degrees to any loading angle. This allows the recovery shackle to always be aligned properly with the recovery loads, using the recovery shackle as designed and minimizing the risk of shackle failure in high load and extreme off-angle recoveries. The Rotator Shackle Mount is CNC machined from 7075-T6 aerospace-grade and 6061-T6 billet aluminum for maximum strength, light weight and rust-proof performance. Traditional, rigid recovery shackle mounts present several problems in the design of a front-end system. The first issue is simply strength. 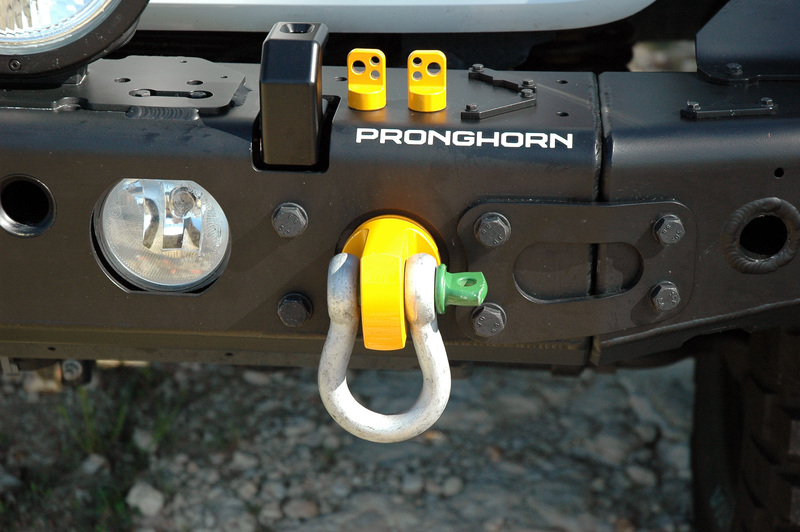 A rigid shackle mount utilizes a standard rigging shackle to allow recovery gear to be attached. These rigging shackles, while extremely strong, are not designed to be used in side-loading scenarios. In fact their strength reduces sharply as the applied load move from a straight ahead or in-line pull to a side loading pull with strength falling by 50% when the load is applied at 90 degrees from in-line pull strength. The Rotator Shackle Mount eliminates side load pulls by allowing the shackle to freely rotate to any angle, maintaining full shackle strength. 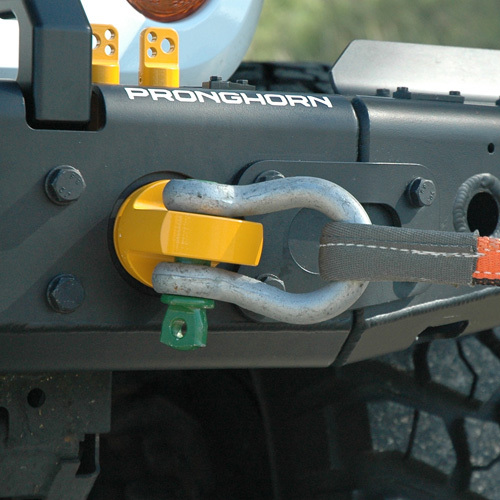 Standard rigid shackle mounts also present a problem when not being used in the fact that they must, by design, protrude from the body of the front-end system. This presents large snag point for obstacles (logs, rocks, etc.) you may be trying to drive or skid over. This is made worse on many bumper systems in that the shackle mounts are positioned low or even underneath the bumper. 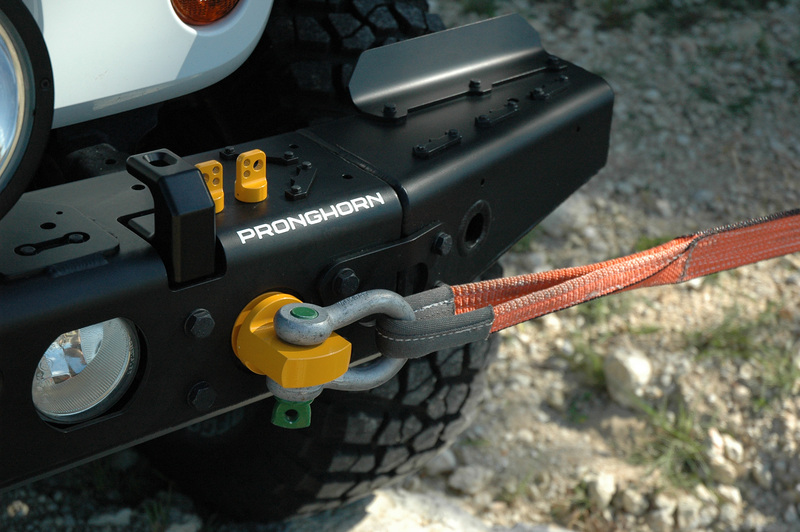 This provides even more snag interference, as well as making access to the shackle mount even more difficult when the vehicle is in deep mud, sand, snow or water. To solve this problem the Rotator Shackle Mount is a quick disconnect design that allows you to completely remove the shackle and shackle mount in 15 seconds. The main shackle pin is retained by two quick release, high-strength retainer pins. Simply rotate the pins and remove, then pull the shackle and shackle pin from the Alpha A/T. 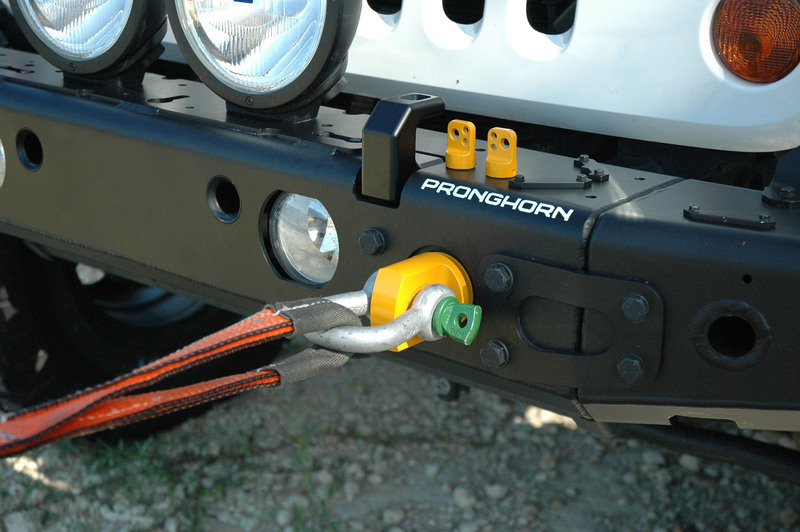 This design also allows you to use a single shackle and shackle pin in any Pronghorn Rotator Shackle Mount, whether on your Alpha A/T front bumper, your Omega A/T Twin rear bumper or another vehicle equipped with Rotator Shackle Mount components. The Rotator Shackle Mount can mounted on left-side, right-side or both as a dual mount system depending upon your recovery requirements (see photos above). 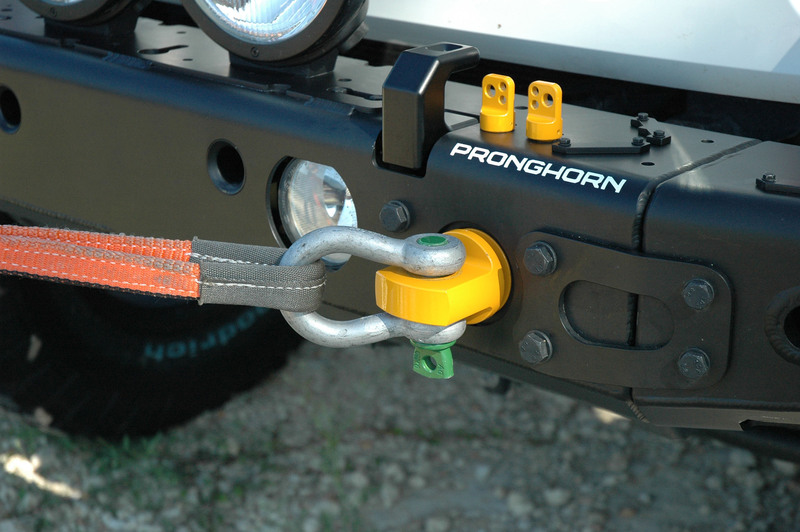 It can also be used in conjunction with either the Dual Recovery Hooks or Shackle Mounts. 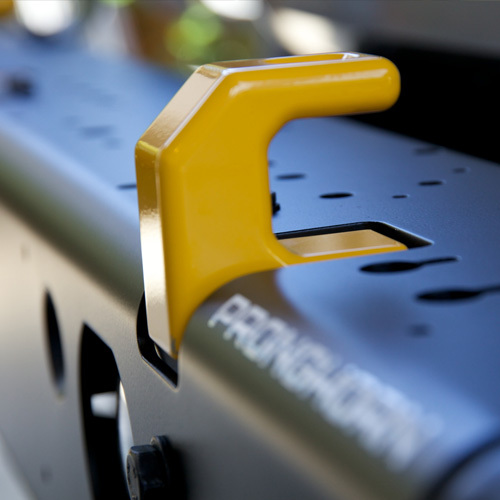 The Alpha A/T Front Bumper Dual Shackle Mounts are 2-stage powder coated and available in recovery yellow. Fasteners are grade 8.8 and OE-grade triple coated for maximum corrosion protection (1000+ hr salt spray test). The Alpha A/T Rotator Shackle Mount is designed for severe duty and extreme side angle recovery operations where maximum strength and performance is required. The full-rotation design eliminates weakness inherent in static shackle mounts and recovery shackles by allowing the recovery shackle to remain constantly in line with the recovery pulling load. Static shackle mounts are not suitable for extreme side angle operations. The Alpha A/T Rotator Shackle Mounts are constructed from CNC machined 7075-T6 aerospace-grade and 6061-T6 aluminum billet. This rust-proof, high-strength, lightweight material provides excellent strength and performance. In addition, the aluminum construction provides a rust-proof structure, which is critical for long term durability for a component designed to endure frequent impacts and abrasions that will damage and remove protective coatings. Our all aluminum design requires no coating to withstand rust and we could ship them uncoated without issue. However, we provide a 2-stage powder coating to match the Alpha A/T. 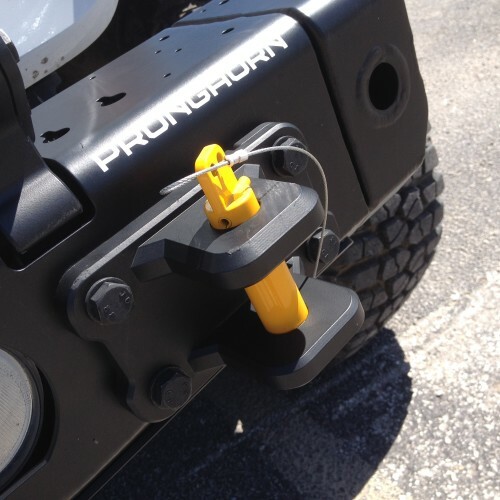 We offer the Rotator Shackle Mounts in recovery yellow. 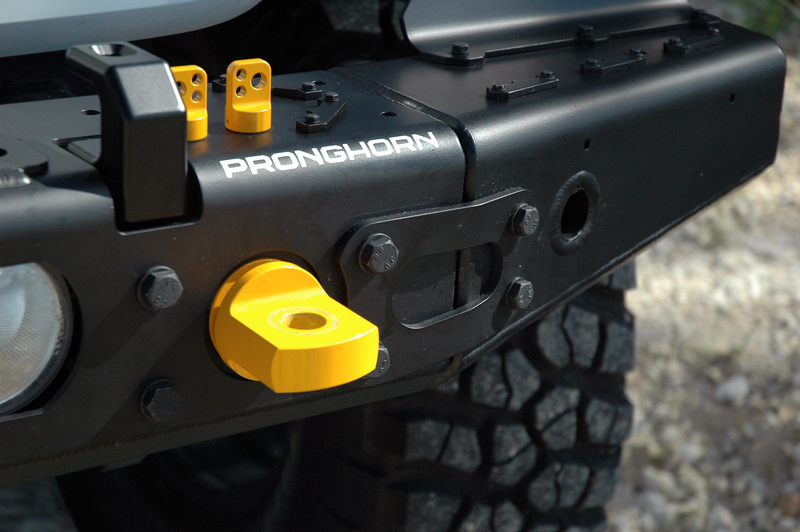 Powder coating will be chipped and scratched in the off-road environment, especially in use with recovery gear. There is no coating that can withstand the severe abuse seen with the Rotator Shackle Mount and coating damage should be expected. This cosmetic damage can be touched up with paint or left untreated as desired. 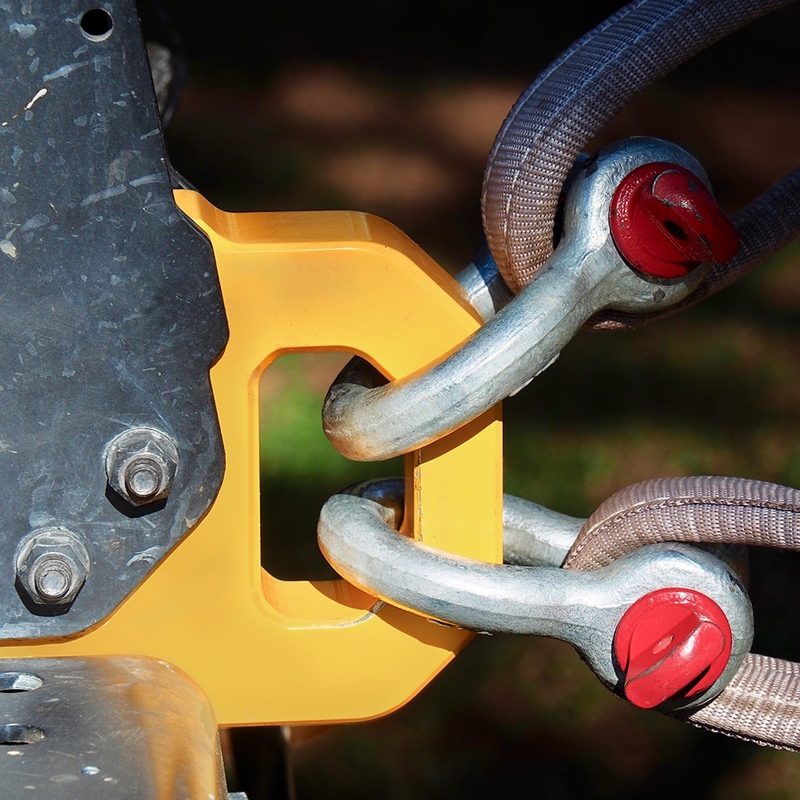 To ensure high-strength performance we use all grade 8.8 fasteners on the Alpha A/T Rotator Shackle Mount. These are treated with a 3-stage OE-grade coating for maximum corrosion protection (1,000+ hr salt spray test certification).